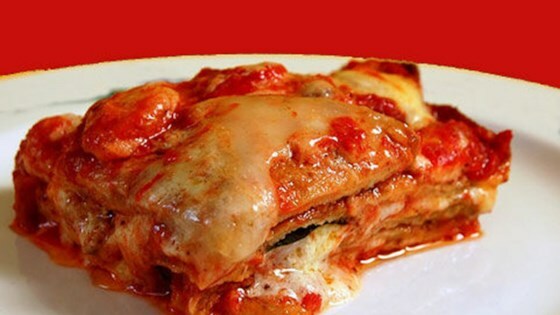 "This classic Italian dish from Sicily is often simply referred to as 'Parmigiana' by the Sicilian locals. The richness and depth of flavor that you get from this authentic version is well worth the extra effort. Serve eggplant Parmigiana with nothing more than crusty bread and a green salad." Heat about 1 inch extra-virgin olive oil in a deep skillet over medium heat. Pat eggplant slices dry with a paper towel and fry eggplant in batches in the hot oil until golden, 2 to 3 minutes per side. Transfer eggplant to a paper towel-lined plate using a slotted spoon; season with salt. Combine tomato puree (passata), 1 tablespoon olive oil, garlic, salt, and 4 basil leaves in a saucepan; simmer over medium heat for 10 minutes. Remove garlic from sauce. Place a layer of fried eggplant in the baking dish and cover with a layer of tomato sauce. Top with a layer of mozzarella cheese, oregano, Parmesan cheese, and chopped basil leaves, in that order. Continue layering in the same order with remaining ingredients, ending with a layer of mozzarella cheese and a drizzle of olive oil. Bake in the preheated oven until heated through and cheeses are melted, about 40 minutes. Let stand a few minutes before slicing. Fresh mozzarella can be very soft so it might need to be drained before using. Too much water will soften the fried eggplant and produce too much water in the Parmigiana. You can replace fresh mozzarella with scamorza cheese, which is a bit drier but just as tasty. To make ahead, prepare the Parmigiana up to 24 hours in advance and let it sit at room temperature for 4 to 6 hours or in the fridge for longer time. This way, the eggplant will have the time to soak in the sauce and you'll get a tastier Parmigiana.